This cultural trend, to not associate, predictions given by elementary physics (taught in Europe in upper classes of grammar schools), with major events related by the world media, leads to NEW OBSURANTISM forming an OBJECTIVE EVIL of times we live in. Which evil of course irritate experienced teachers of physics, as well as architects and engineers, which professional group in USA has managed to form, apparently impotent, “countercultural” AE911truth.organization. It is not only the elementary physics, which laws become « suspended » by swindlers controlling the western public opinion. As a retired academic teacher and researcher, working initially in the domain of solid state physics, and geophysics, and than in the history of biological research and finally in political philosophy, I have to recall that the most elementary distinctions between living and not living objects become, very systematically, “forgotten” in both general public and strictly scientific discourse. And due to the disappearance of a precise distinction between these phenomena, the most nefarious social pathologies are becoming dominant. As a former collaborator of researchers from Centre d‘Epistemologie Génétique de Jan Piaget de Genève – in particular of professors Barbara Inhelder and Jacques Vonèche – I will refer below to results of a research done by this Center of world renome (but somehow forgotten at present). On one side, Living objects (zoon, hilozoa, or organisms) – are COMPLEX SYSTEMS, separated by a membrane from their environment, and capable of a SELF-REPAIR WITH AN OVERCMPENSATION. Living beings are thus RE-ACTIVE AND EXPANDING, having a CYCLICAL and dynamically ETERNAL, DIMINISHING ENTROPY, character. On the other side, Non-Living objects (« corps bruts » & machines) – are devoid of these properties: they are NOT SELF-REPAIRING, and thus they are steadily decaying, they are NOT RE-ACTIVE OBJECTS, which are incessantly INCREASING THE ENTROPY (“randomness of distribution”) of their components. This DIMINISHING ENTROPY – it means not disintegrating in time – character of living SYSTEMS is a very well observable general phenomenon. Using terms of cybernetics, Jean Piaget called this phenomenon « la reéquilibration majorante (du système vivant) reagissant à des perturbations (induites à cet système) » (in English ‘the reequilibration, with an overcompensation, of perturbations inflicted to a living system’). How this ‘reequilibration’ manifests itself we may observe not only during the growth, of various mental and manual faculties of children, which phenomenon studied in details Jean Piaget and his associates. This ‘reequilibration with overcompensation of perturbed structures’ we can observe, following the very pre-Christian Greek maxim γνωθι σε αυτον, in particular on ourselves, simply watching the skin on our hands, which becomes ‘worn out’ due to the work done heavy tools: after a period of recovery in place of blisters appear local skin overgrowths, facilitating the relatively painless operation of these tools for long hours. This known to every laic phenomenon was called “hypertrophy due to the use” in scientific literature of 19 century. And all people capable of self-observation know very well that the more we exercise our specific organs, the more they are becoming sturdy and apt to deal with challenges to which they are/were trained for. Already two hundred years ago the French naturalist Jean Baptiste de Lamarck in a treatise « La philosophie zoologique » gave the name of LAWS OF BIOLOGY, to this general zoological phenomenon. With the invention of a microscope it was possible to visualize how this hypertrophy (‘a reequilibration with overcompensation of a structure damaged by its exercise’) happens in detail. In particular we learned that it results from the increase, or (1) of number of cells specialized in a given function, or (2) simply in increase in size of exercised cells, their nuclei included. This second case is particularly well documented in case of the hypertrophy of muscular tissue. 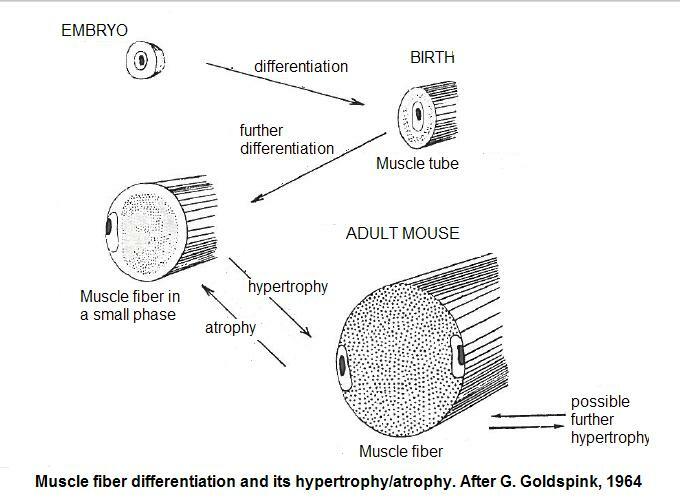 See the drawing below, on it is visible a hypertrophied mouse fibroblast which has double nucleus, being huge “factory” reproducing fibres broken during exercise. As the process (2 – hypertrophy by an increase of number of specialized cells) is considered, it is well observed that people forced to stay, for several weeks, at altitudes more than 2-5 thousand meters, after two or three weeks of “survival” at these altitudes multiply sensibly the number their red blood cells, which permits them to assimilate the oxygen from the air with ease, making thus the stay at these unusual heights comfortable (author’s own experience). In a very similar manner react lymphocyte cells, circulating in the blood and specialized in “cleaning” of the body from unwelcome foreign “agents” (antigens). In case the product of these lymphocytes called immunoglobulin (Ig) becomes “consumed” by its binding to an antigen, it disturbs the relative equilibrium of such “selected by affinity” of its Ig to antibody lymphocytes, which starts to proliferate, in a dozen of days sensibly increasing the capacity of the immune tissue to neutralize antigens considered as “alien”. imilar situation we have during the differentiation and development of our brains. Receptors situated at the surface of our brain cells (neurones) are “disturbed” by signals (chemical neurotransmitters and also by electric micro-shocks). They react to these “perturbations” by their “reequilibration (regeneration) with an overcompensation”, by a rapid increase (hypertrophy) of the number of receptors situated on agitated neurons. For the synthesis of neurotransmitters, which were “used” increases as well (due to their ‘reequilibration with an overcompensation’), we have simultaneous growth of neuronal structures having mutual affinity. Their electrostatically imposed rapprochement leads to a solid and persisting in time ligation (the phenomenon of inter-ligare, intelligence) between neurones excited or simultaneously, or on repetitive time cadence – which neuronal, purely chemical phenomenon is at the origin of externally expressed by us INTELLIGENT behaviours known as ‘conditioned reflexes’ or ‘slaveries of habits’. 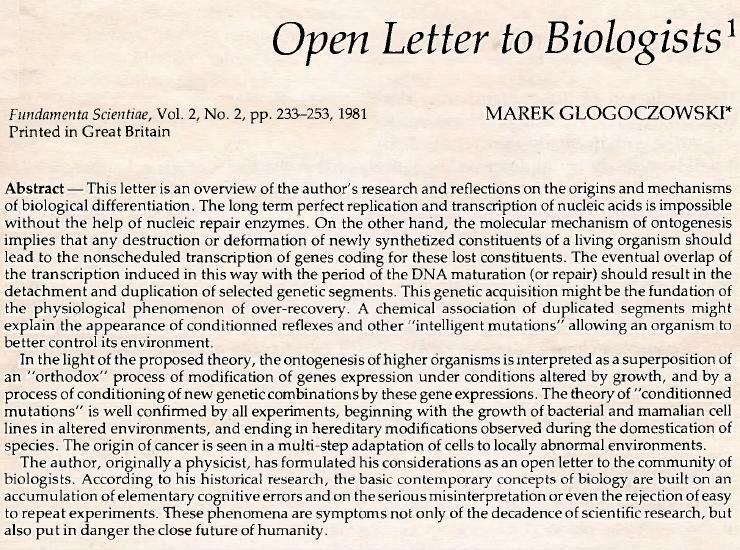 In this “Open letter” I observed that conditioned – it means bound together, inter-ligated, hence INTELLIGENT – reflexes, which frequently are memorized for the whole long life of an individual, MUST BE “MEMORIZED” ON CONSTRUCTED BY US, PRECISE ASSOCIATIONS (INTER-LIGATIONS) OF OUR GENETIC MATERIAL. This due to the fact that all body constituents undergo the cyclical turnover, they are replaced by their novel copies which are synthesized in agreement with their “genetic script”. (The cycle of this turnover lasts only dozens of hours in case of epithelium, and more than 3 years in case of our bones). It means that for example, in order to express, at author’s age of 72, the conditioned reflex provoked by the vocal signal in a form of a French expression “faire amour”, assimilated by the author at age of 22, this author imperatively needs to have in his mind, in nuclei of neurones controlling his behaviour, “the genetic script” how to react to such a specific perturbation of his sensory system. The problem of elucidation how, in detail, conditioned reflexes (by Lamarck called ‘habits’) are CONSTRUCTED (the term coined by Jean Piaget) was indeed challenging, and at the beginning of 1981, while searching for a scholarship permitting to elaborate details of the necessary genetic “acquisition” of conditioned reflexes, the author presented himself, with the galley-proof of his “Open Letter to biologists”, at the office of a director of Institut Pasteur in Paris, professor Jean-Pierre Changeux, following a scholarship offer in this famous Institute. I admit that at this moment I (being only 4 years younger than Changeux) was not able to hinder myself and I answered something like this: “It is you, as a specialist of neurology, should know, that in case a young man, in his adolescence, is not exploring actively the world, and is not exposing himself to the greatest possible number of impulsions (‘perturbations’), he later on in life, no matter how arduously he will work, will not find something truly creative, for he would have not enough neurones which are necessary to do it!” Needless to add that after this exchange of views my scientific career in France ended. My case might be a good example for Darwinians that the evolution of human species is achieved by the elimination of individuals having the overabundance of neurones not permitting them to fit to demands of their environment. Despite such an appearance, in a larger perspective, my example of a “struggle for life”, might be used by Lamarckians, which argue that in a situation of repeated danger, living beings are able to find themselves a niche, in which they can not only survive but also develop – senseless from the point of view of ever greater number of “scientists” – their habits of perfection of their sensory organs. Author’s academic career had a “restart” at his age of 55, when he become a professional academic philosophy teacher, and at his 60 anniversary he completed his late doctoral dissertation titled “The ‘Antizoological’ socio-political philosophy of Noam Chomsky”. During the research of Chmsky’s biography it turned out that this internationally known linguist, and critic of American Establishment evildoings, was strongly influenced in his scientific research by a group of French neoDarwinian doctrinaires, in particular by Nobel Prize Winners Jacques Monod and Francis Jacob. This mini-group was headed by the known personally to me 20 years earlier in Paris, “computerized neurologist” Jean-Pierre Changeux, author of “L’homme neuronal”, in which he announced his revolutionary discovery “L’apprendere c’est eliminer” (to learn is to eliminate superfluous axons, synapses and even neurones). Studying Chomsky’s works I realized that he has pushed revolutionary arguments of his French colleagues further on. In 1996 under the auspices of Polish Academy of Science was published a 2 volume opus titled “Noam Chomsky’s attempt at scientific revolution”, containing papers written not only by Noam Chomsky and J.-P. Changeux, but also by and Jean Piaget and Barbara Inhelder, which made polemics with mentioned above enthusiasts of “Darwinian selectionism”. But how, in detail, this regression (earlier called atrophy) of synapses works? Changeux is silent about this Lamarckian problem. Instead of dealing with, it he points in his works that our juvenile brains are “overstuffed” with not yet maturated axons, out of which circa 35 % die out during our adolescence. This known to neurologists phenomenon apparently furnishes the proof that LEARNING CONSISTS OF ELIMINATION OF SUPERFLOUOUS NEURONAL INTERLIGATIONS, purging our intellect from futile “childish” associations (“apprendere c’est eliminer!”). But isn’t this “discovery” a concealment of a very uncomfortable, especially in case of so-called bourgeoisie, physiological phenomenon of regression of human neuronal structures due to the lack of a sufficient number of environmental “perturbations”, which are necessary for the ”open mind” development? If we enlarge the scope our research to the field of developmental embryology, we find several characters which appear in human foetus, and which later on disappear: to mention only our tails and rudiments of branchia at our necks during certain period of our foetal life. Why do they disappear? Lamarckians would say that they are, vanishing with time, “memories” of aquatic and later on quadruped period of evolution of our very distant forefathers: these organs become obsolete once our fore parents left the aquatic milieu and took an upward position in which the long tail become of no use. The lack of these characters in newborn babies is an example of a “minorant reequilibration” of body parts which were not “perturbed” by their exercise during long periods: the drawing made by Goldspink in 1964 (see above), illustrate how the non exercised mouse muscle cells retract to their small phase, having only one nucleus containing genetic material. The fact that domesticated animals have smaller brains (and thus lower number of neuronal interconnections) than their cousins living in free nature, is well known, Changeux in his book “Neuronal man” recalls that birds kept in cages have on average 10-15% smaller brains than their cousins in nature, also humans of today have their cranial volume (about 1300 cm2) significantly smaller than our Cro-Magnon distant ancestors (up to 1700 cm2). And if one wants to see how Lamarckian “acquired characters” are inherited, it is sufficient to look at statistics of inheritance of so called civilization diseases, like obesity, various sight diminishments, diabetes, veins and so on. These (usually appearing suddenly) atrophies of specific organs are, by their definition, “acquired” by a not sufficient “exploitation” of these organs during our (or our parents and foreparents) comfortable life in ever more “domesticated” environment. This is a not comfortable message to be publish in mass media, in ever shorter intervals between advertisements of “miracles” of consecutive technical life facilities. By the very nature of the liberal society, in media dominate an optimistic view, that cultural and other acquisitions of homo sapiens, are not products of generations of our ancestors, trying to understand better both themselves and the world around them. To the contrary, “the genetic accident is at the origin of all novelty in biosphere” (Jacques Monod in “Le hazard et la necessité”, 1970) The absence of precise observations how new habits forms, began since this year 1970 to be contagious, Noam Chomsky influenced by Jacques Monod admitted that he believes that the habit of communication, by means of language, appeared as a chance event in a distant past, and not by efforts of our ancestor to express vocally their desires, really so!). Hearing, already 35 years ago, at the British television such “scientific revelations”, the sociologist Michel Thompson wrote in a rarely read by biologists book “Rubbish Theory – on creation and destruction of values” that “In life sciences we witness a systematic channelling of enquiry in order to impel knowledge ever further from the truth, to make people not see how things really are, la trahison des clecks”. This pertinent opinion of an active himalaist (at that time I was a himalaist, too) was somehow echoed on December 20 this year, by a song sang by the team of Witkacy’s Theatre in Zakopane “The discovery is the concealment, the elucidation is obscuration and two plus two cannot be four”. No doubt these words should be considered as “Principles of the Academi” forming so called “informational warriors” in life sciences of today. In 1981 the director of CIA William Cassey, during his first staff meeting, told his co-workers “We’ll know our disinformation program is complete when everything the American (and in a perspective the World) public believes is false.” The sensed by more bright people, results of such “humanitarian” activities of CIA, gave the impulse to write a cabaret song with a refrain “The discovery is concealment, explanation is obscuration and liberation is subjugation”. The concordance of words of this song with the program of CIA organized public education, and the with practices of neoDarwinian Academi of Bio-Sciences, suggests an “invisible” inter-ligation between these institutions, having their “metastases” in all countries around the world. We understand thus why J. P. Changeux was decorated with the French “Legion d’honneur” distinction, and why N. Chomsky become famous with his “universal generative grammar” absent in Polish language. The “invisible link” between doings of Bio-sciences informational warriors, and CIA’s global subjugation programs, is not the only one “mystery of Americanized civilization”. In recent years we are literally “drowned” by TV news, coming from presidential palaces in Warsaw, in Prague, in Moscow, announcing that presidents of indicated countries participate in Jewish Chanukah festivities, imitating such festivities held in White House since December 2001. (By the way, in year 2013 the president of Ukraine Janukovich refused to participate in Chanukah ceremony, and only ten weeks later he ceased to be the president of Ukraine.) During this religious festivity participants play the “dreidel” humming top hazardous games. What a deeper sense has this traditional, among orthodox Jews, childish game? Is it not an indication to participants that the success in life is the fruit of a chance, and not the result of efforts to excel in socially useful domains? Somehow this “dreidel spin” game recalls Jacques Monod’s bold statement “the chance is at the origin of all novelty in biosphere” – which message is of course a spin, intended to conceal origins of pathology of CHOSEN PEOPLE dominated “open society”. The expressed above suspicion pushes us to a subsequent association (it is a conditioned reflex of our brains) that artificial lights of Chanukah obscure dark realities of this peculiar religion, in which “elucidation is obscuration, liberation is subjugation”, as chanted on December 20-th this year actors of Witkacy’s Theatre in Zakopane. In all evidence works of the Central Intelligence Agency, of “Academi” of bio-sciences spin doctors, and of ZOG – it means of Zionists Occupied Governments – are mutually interconnected. Already more than 15 years a ago I realized, while preparing a Platonian dialogue titled “The Syndrome of Blind Watchmaker” that ALL NEODARWINIAN IDEAS OF THE ORIGIN OF SPECIES WE FIND ALREADY IN THE HOLY BIBLE, no observation of the outside world is necessary to construct this Judeo-Darwinian theory of Evolution (see the Table in Attachment II). “And God blessed Noah and his sons and said to them (…) “The fear of you and the terror of you will be on every beast of the earth and on every bird of the sky; with everything that creeps on the ground, and all the fish of the sea, into your hand they are given”. What kind of a MONSTER gave to his Chosen People the order to behave like TERRORISTS of all living (hilozoa)? Only a MICROCEPHALOUS BEING could invent such an UGLY program for created, at his own image, creatures. There are more proofs of this cognitive illness of “God, which existence is forbidden to deny neither to blaspheme” as declare it the first two Noahide Laws. To such, preached not only by Jews but also by Christians idiocies belong in particular the “revolutionizing biology” assertions of Isaiah (25, “He (God) will swallow up death for all time”, proudly repeated by St. Paul “The last enemy that will be abolished is death.” (1 Cor. 15, 26), and than by St. John “there shall be no more death” (Rev. 21, 4) . These prophets were completely unaware that zoon – humans included – has a well described by Aristotle cyclical form of existence, and thus death is a trivial necessity during the continuous turnover of every bio-material, our bodies included. What kind of imbecile dreams were promoting these microcephalians visibly believing, like the beloved by the Christian priesthood St. Paul that “The foolishness of God is wiser than the wisdom of men”: statements of this type are forerunners of this Orwellian hymen “elucidation is obscuration, the truth is falsity, and liberation is subjugation” sang in Witkacy’s Theatre in the middle of Chanukah 2014. I feel pity for all these Christian priests and pastors, which must force themselves to teach such “bull from the Lord” to their “sheep” (as allegedly Jesus called Christians). We have to remember that IGNORANCE IS AT THE ORIGIN OF ALL OBJECTIVE EVIL, as old pagan Socrates taught his disciples. Already 15 years ago, John Strugnell the head of the research team, which studied manuscripts found in Qumran near the Dead Sea, summed up his 30 years long study of ancient Hebrew scriptures in only one sentence “Judaism is the horrible religion, which should not exist”. This is not the new message. 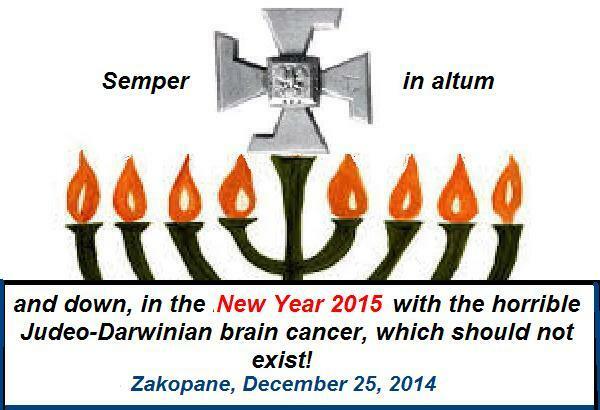 With the pathology of Judaism tried to fight Hellenist Jews under guidance of Tobiads already in the 2-nd century BC. After few years of successes Hellenists, due to a “feminine deceit”, lost the war, and Chanukah festivity was established to celebrate the victory of YHWH ETERNAL IMBECILITY over REASON worshipped by Greeks. Today is the very time to renew this, lost 22 centuries ago battle. To obtain the wider acceptation of any scientific idea, its receivers should have their individual associative apparatus appropriately tuned-up for its reception. In the Anglo-Saxon culture men are (were) grown since childhood with the lecture of the Bible, and thus the reality they perceive is in a large extend modeled by “directing truths” of the Holy Scripture. This fact, well known in the developmental psychology and neurology, is sufficient to explain both the genesis and the commercial success of contemporary Darwinian concepts of evolution. 1. The logical conclusion of the God’s order multiply and fill the earth – which has been inserted into the first page of the book of Genesis – is the previsible overgrowth of the number of living items over their possibility of feeding. Such a “divine order” must lead to the struggle for existence imagined by an Anglican clergyman Thomas Malthus. (The Old Testamental archetype of such struggle for means of existence and proliferation is provided by the attitude of the patriarch Jacob towards Esau, and in general, by the attitude of Jews towards other nations.) This inter-specific struggle for life has become the essence of the theory of evolution elaborated by an another theology graduate, Charles Darwin. 4. In no point of its teaching the Hebrew Torah admits the idea that the collective, critical cognitive effort (similar to the one which is known from Plato’s Dialogues) may lead to a better understanding of the world, and thus to a better life in it. The interdiction of questioning of “revealed” dogmas leads to the functional atrophy of whole range of brain reflexes of human populations grown in the artificial world created by the frequent lecture of the Holy Scripture. Such (past and present) societies have a tendency not-to-see particularly those absurdities, which in their logical structure resemble the fake orientational truths, inoculated into the Bible in a form of cultural “mind viruses”. 5. The archetype of the neoDarwinian idea that from harmful heritable infirmities called mutations, appear novel, better adapted to the environment variants, we may find in thoeologico-naturalist thought of St. Paul, in the same Letter to Corinthians we quoted above: is sown in disgrace (the seed of evidently infirmous theory) – is grown-up in glory (the body of a new, world-encompassing infirmous religion or science). We have here an analogy to cognitive inventions of cabala: there is no better good than the one, which arises from an evil. The whole neo (and ultra) Darwinian theory we may thus reduce to the natural selection (see pt 1) of bodies grown from hazardously created variants of seeds (pt 3). It means that the totality of contemporary concepts of evolution we may deduce logically from few simplified sentences incorporated into both the Old and New Testament. Those concepts are cognitively “empty”, but nevertheless they are impressing laics in a similar way as the ordinary Jews were impressed by the empty interior of Jerusalem’s Temple. And we are invited to hate all those who demonstrate the cognitive emptiness of Darwinian sciences, in the very same way as Pompeius was hatred by Jewish priesthood for his act of tearing-down the cover hiding emptiness of the famous Hebrew Temple of Misologos. This entry was posted in culture & religion of zombies, ENGLISH TEXTS, genetics of bio-development. Bookmark the permalink.